A few weeks ago my coworkers and I attended a Career Coach Intensive training through NACE (National Association of Colleges and Employers) and one of our break-out activities was to create something, anything, related to our career out of pipe cleaners. My co-workers Meagan created a brontosaurus and when it was her turn to explain what she made she described how she see herself as a brontosaurus, with their tall necks they see the big picture, they leave a big footprint and keep a big heart. A simple and meaningful metaphor that I believes describes, not only advising, but our profession as a whole. Many of us stumble into this profession because we want to “help people,” and we want to help develop students during a pivotal time in their lives. Whether they know it or not, we are their brontosaurus. I encourage each of you to continue being a brontosaurus, especially during this last month of the semester. Remember while your students are focused on getting through finals, help them see the big picture – that a bad grade is not the end of the world. 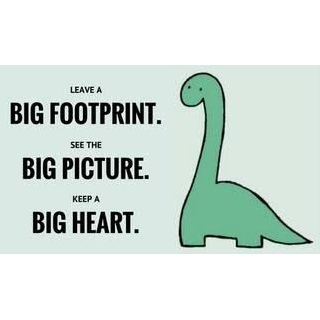 Keep a big heart in supporting your students, but do not lot your heart get so big that you take on too much. Lastly, leave your footprint – a lot of times we do not notice or realize we are leaving footprints, and with our students we may never realize that we are leaving a footprint with them. Each of us has a different role in this position, but each of us is a brontosaurus.